World Bear Day is a celebration dedicated to the rescue and protection of the bears around the world, regardless of the species and natural habitat. On March 23 everyone interested in wildlife care, can participate in celebrating this event. World Bear Day is a wonderful reason to spend the time with pleasure and joy. Beside that, it also can help to improve the lives of lots of bears. It is a positive way to spread the information about the plight of the bears around the world, as well as to change the sorrowful situations with exploiting of the bears. We wish everyone – bears and humans – live a happy life! The very first important step which you can do for the bears is to be bear wise. It means that your lifestyle and activities are animal-friendly and don't lead to any harm to the bears. Your example will as save the lives of animals as encourage other people to support them. Remember that bears who live in rehabilitation centers are also always need your help. They get correct diet, medical treatment and all the care. Bear centers construct homes for them and do incredible work, which requires a lot of funds. And there are animals who are still waiting to be rescued. Your generousity by the sponsorships and attention make the dream of such a suffering bear come true! Please, follow the news of Bear rescue organizations to support their missions in time! VISIT THE OFFICIAL WORLD BEAR DAY SITE! CANE supports the International Day of Forests held March 21 every year. To tell world leaders that recycling is simply too important not to be a global issue, and that a common, joined up approach to recycling is urgently needed. To ask people across the planet to think resource, not waste, when it comes to the goods around us – until this happens we simply won’t award recycled goods the true value and repurpose they deserve. As a direct result of the success of Global Recycling Day 2018, the Global Recycling Foundation was born in October 2018. The Foundation, formed by the Bureau of International Recycling but run as an independent organisation, will promote and support the global recycling industry in its mission to showcase the crucial role of recycling in preserving our planet’s future. The creation of the Global Recycling Foundation is a crucial step in securing the long term future of Global Recycling Day and other initiatives aiming at the promotion of a global and united approach to recycling. It is widely understood, indeed it is at the heart of the UN’s Millennium Development Goals, that climate change is the major, overriding, environmental issue of our time. Collectively, we have to take urgent action. By combining as many voices and efforts as possible on a single day, the aim has been simple: to drive awareness and to push the urgent need to recycle more effectively around the world, to assure the future of our planet. Global Recycling Day will be held on March 18 every year, a day to change the mind-set of governments, businesses, communities and individuals around the world, to see recyclables as resource – not waste. We have set out the vision for the Seventh Resource in our Recycling: The Seventh Resource Manifesto which was sent to world leaders, UN organisations and environmental activists in 2018. It can be downloaded HERE. After the successful launch of Global Recycling Day in 2018, the Global Recycling Foundation has announced the theme of 2019 as ‘Recycling into the Future’. Global Recycling Day will focus on the power of youth, education and innovation in ensuring a brighter future for the planet. 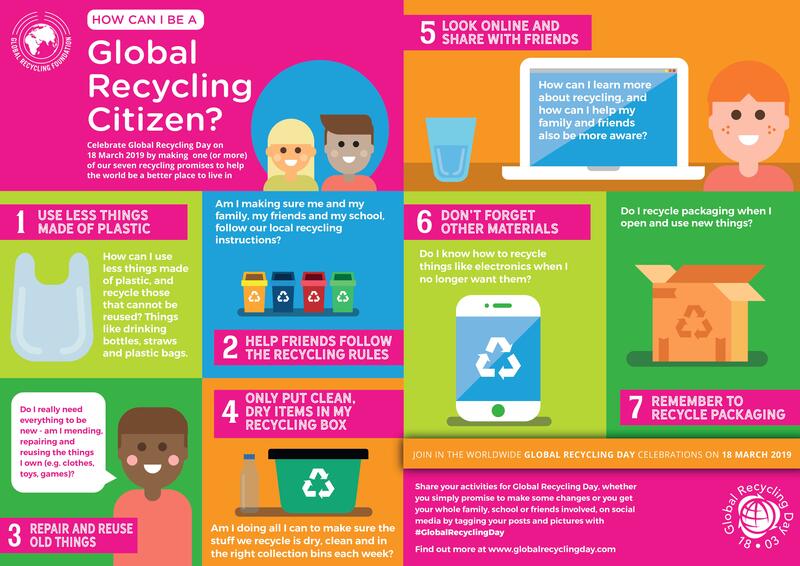 It will take place on 18th March 2019, when people around the world will be invited to show their support for recycling. DOWNLOAD THE SOCIAL MEDIA KIT! For more information visit the dedicated pages on this website. Our polar bear maternal den studies add to our understanding of the behavior of families at den sties, including their sensitivity to disturbances. VISIT POLAR BEAR INTERNATIONAL FOR LOTS OF RESOURCES, TEACHING MATERIALS, AND MORE INFORMATION! Radon is a radioactive gas that is formed naturally by the breakdown of uranium in soil, rock and water. Radon is colourless, odourless and tasteless. When Radon is released from the ground outside it mixes with fresh air and gets diluted resulting in concentrations too low to be of concern. However, when Radon enters an enclosed space, such as a house or basement, it can accumulate to high concentrations and become a health risk. Radon gas can enter a house any place it finds an opening where the house contacts the soil: cracks in foundation walls and in floor slabs, construction joints, gaps around service pipes and support posts, floor drains and sumps, cavities inside walls, and the water supply. Radon can also be found in groundwater from private or small community wells. Radon produced in the ground can dissolve and accumulate in water from underground sources such as wells. When water containing Radon is agitated during daily household use â€“ showering, clothes washing or cooking, for example, the Radon gas can be released into the air. However, research has shown that drinking water that contains Radon is far less harmful than breathing the gas. The health risk does not come from consuming the Radon, but from inhaling the gas. And in most cases, the risk of Radon entering the home through water is much lower than if it enters through the ground. Almost all homes have some Radon. The levels can vary dramatically even between similar homes located next to each other. The amount of Radon in a home will depend on many factors. Because there are so many factors, it is not possible to predict the Radon level in a home; the only way to know for sure is to test.